Swedish massage refers to the type of strokes normally used in a massage; all Swedish massages use the same strokes. The therapy used is determined by the particular problems each client has, such as TMJ, tendonitis, sacroiliac, etc. Jodie uses a lot of Myofacial Release and Trigger Point Therapy among other forms of therapy, depending on the need of the client. There may be some mild discomfort during therapy. If you feel any discomfort, it is essential that you tell Jodie so that she can adjust the treatment accordingly. 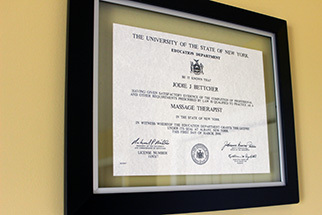 Jodie's clients have experienced a lot of relief due to her treatments. Read some of their testimonials to find out more. 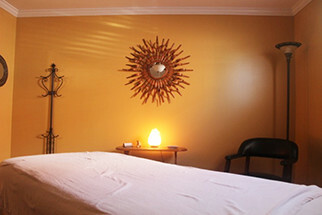 Hot Stone Massage involves the application of heated stones to the body. In this type of massage, Jodie uses round, smooth stones that are gently heated to a luxurious warmth to massage the body. The stones' heat penetrates the body to provide profound relaxation, increased detoxification, and relief of long-standing muscular tension, stress, and fatigue. Expectant mothers in their second and third trimesters will relish this stress-relieving, relaxing massage. The extra weight from the baby adds a lot of strain to the back and hips causing the mother discomfort. Jodie's prenatal massage is safe and healthy for the baby, and great for relieving those aching backs and hips. Mothers are comfortably positioned on their backs and then on their sides, surrounded by pillows for support and the ultimate massage. An excellent gift for the mommy-to-be in your life. Infant massage increases bonding between babies and their parents and care-givers. Not only will it release stress in your baby, it will also stimulate circulation and strengthen the circulatory, intestinal, and immune systems. Infant massage reduces discomfort from colic, gas, constipation, teething, and congestion. It also deepens respiration, develops muscle tone, and improves sleeping patterns. For the parents, it improves relaxation, and reduces stress. It increases communication between baby and parent and makes for a calmer, happier baby and, in turn, a calmer, happier family. Parents will gain confidence knowing they have the tools to care for their baby. In one session, you will learn how to give your infant a massage, learn to give infant exercises, and what to do in special situations such as crying, fever, and teething. One-on-one sessions and group training available. Call Jodie for details: 716-697-0667. Experience the relaxation achieved from receiving a chair massage! This form of massage is excellent for those who cannot lie on a table or can not come to the office for a massage. Businesses love to reward their employees for their efforts with this mode of massage. You can have them done right in your office, and at only $1.00 per minute, it is a very economical way to say "Thank You" and get your employees feeling great!